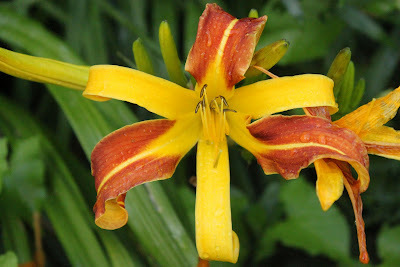 In the garden, Daylilies only last a day. Dip in batter (corn flour, 00 wheat flour, pinch of salt, pinch of ajinomoto, fizzy water). 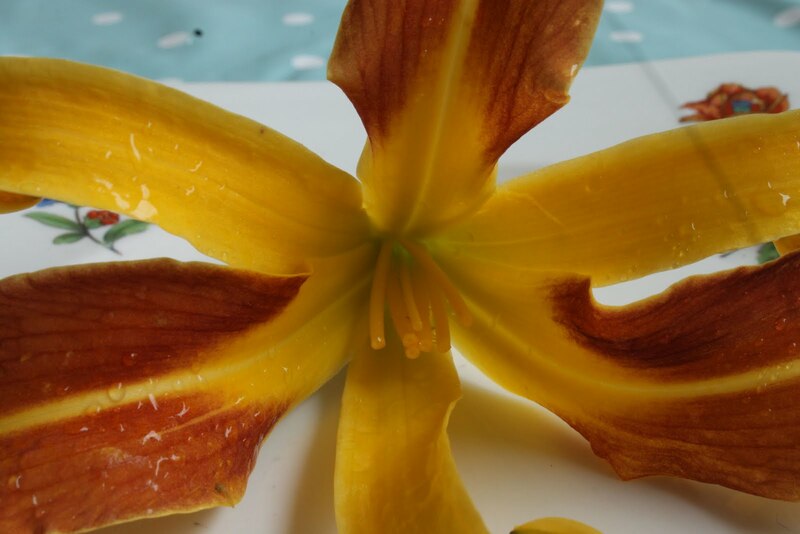 Handle gently as petals come off easily. 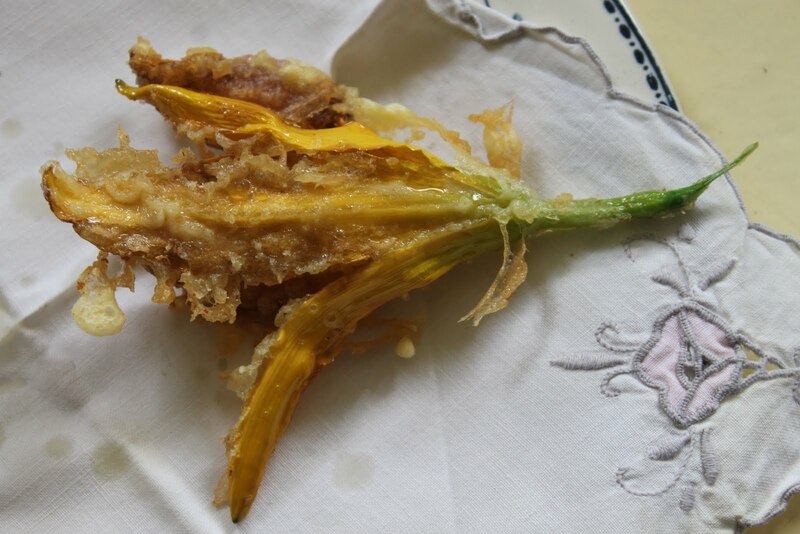 Move over courgette flowers, Daylily tempura has arrived! 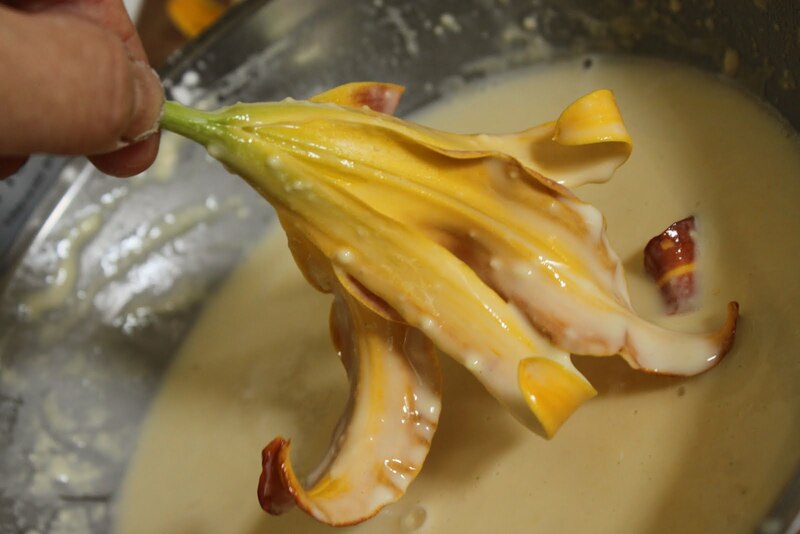 As regular readers will know, I enjoy cooking with flowers. 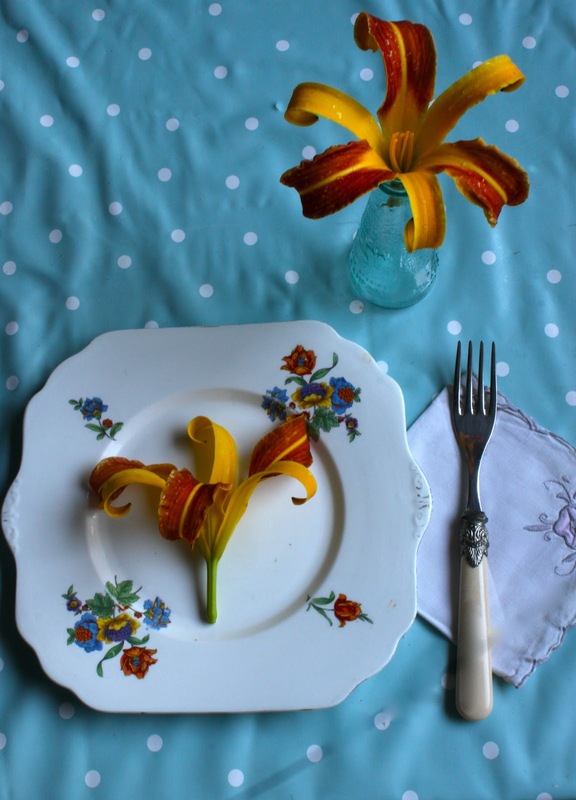 I’ve done several edible flower based supper club nights and it will be the theme of my menu at Camp Bestival. As well as the classic fried courgette flowers, I have used nasturtiums and their leaves in salads, added borage and rocket flowers to drinks, turned prosecco a deep pink with hibiscus flowers and steamed brightly coloured tulips with broad beans and tapioca pearls. Rose petals can be candied and sprinkled over desserts while lavender and thyme flowers are plunged into bags of sugar, permeating the crystals with floral hints. My latest flower crush is Daylilies, possibly the sweetest almost sherbety of them all. 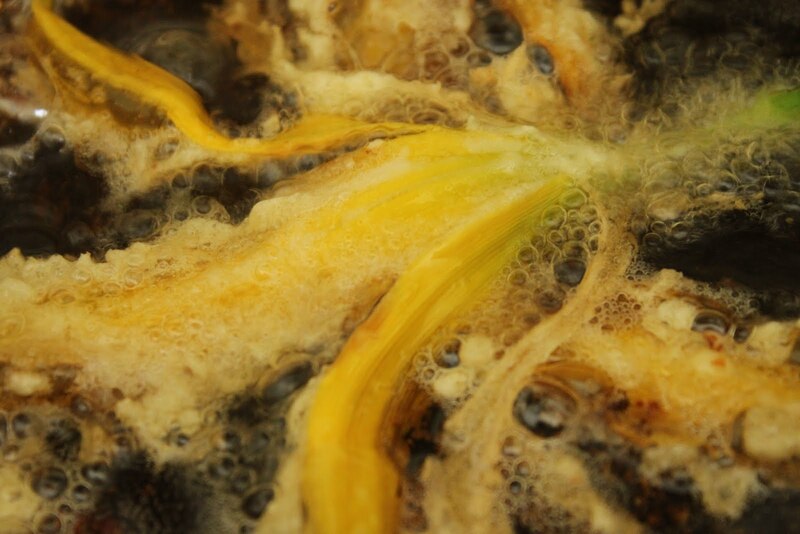 Simply steamed, the stamens removed, the honeyed petals delight. I used the ones from my garden, thereby ensuring that they are organically grown and pesticide free. Other ideas: crushed into ice cream, as garnish for salad, in hot and sour soup (very Chinese), battered and fried…. I still can't get over how delicious these were! SO sweet. I would grow them just so I can eat them. When I was at Capel Manor College, our tutor used to get us to try stuff around the grounds with his guidance. Pignuts, chickweed, amelachier berries and day lily buds. Seem to recall him saying that the yellow and orange flowers were the best to eat. 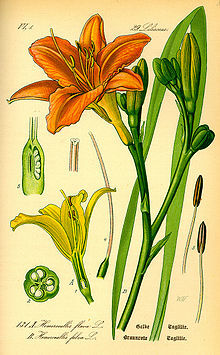 The wild variety is known in the States as the Ditch Lily and is orange, so I guess that's closest to true. My goodness! Is that the same common flower we have here in North Carolina?? They are a little past blooming here, but I am going on an all-out search this afternoon to find some to cook up. That looks amazing. Your website is so inspiring. Can't wait for your next book- I do hope it won't be long. I continue to use your recipes at my supper club and invariably they are the favourites of the night. PS I love your mother's comments about your cooking on the Maille post… mother's eh? thanks everyone. They were delicious weren't they Helen? Blue Shed: I've tried the buds and they are extra sweet. Lulu: I guess so…let me know how it goes! aoife: thank you so much. My mum, she means well but.. I've got another book up my sleeve, just waiting for confirmation of when it's going to happen. thanks for the great tip on edible flowers! My knowledge of edible flowers have been limited to courgette flowers and cauliflower if that counts. A battered and fried flower always sounds good, though i would leave out the msg! (: thanks for the recipe otherwise! first time on your blog, and so pleased to fidn out i've stumbled upon the one who first started london's underground supper clubs!